This is my least aesthetic repair thus far but I like the results. 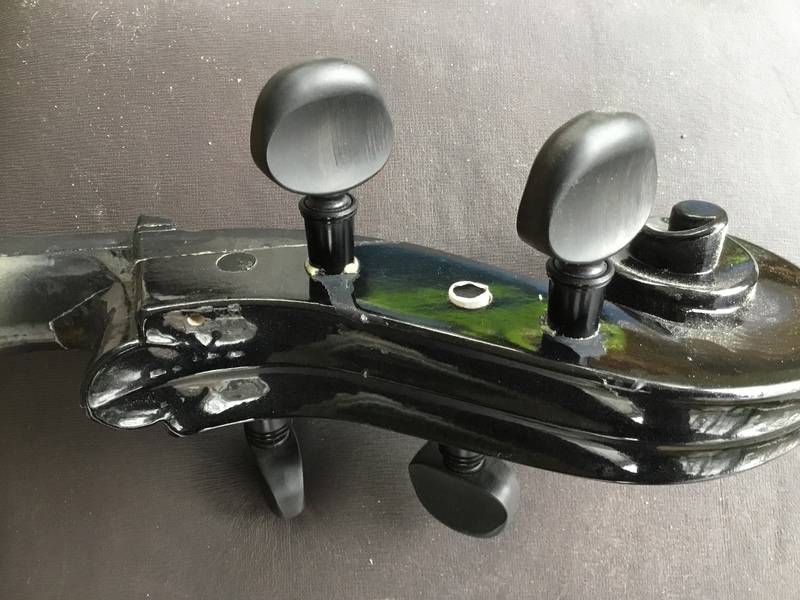 About a year ago, I purchased a Cecilio electric (solid body) cello that was reported to be a violin on eBay for $40 including shipping. The pegbox was splintered during shipment but I kept it since, well, it was likely my only chance to get one so cheap. Repaired damage with Titebond glue and cf rod and was going to hide repairs with bondo and black paint, but never got around to it. Needed to get a practice cello in a hurry so I tried to put Knilling pegs on it. The wood was so soft that I did not think that pegs would hold without glue, so I used Gorilla brand urethane glue. Too much of it. Got everywhere once it started to expand, but fortunately did not get into peg mechanism. I tried to create a bearing surface for the turning portion of the peg (opposite the knob) with Teflon plumbing tape. The bridge is ugly but seems to be nicely radiused to the fingerboard so I just roasted it and used it. I wanted to experiment with an Akusticus 3/4 tailpiece so I used that. An interesting fact. Akusticus markets three different tailpieces. They all measure 22 cm, and use different lengths of metal tail gut to make up the difference in size. The provided strings were junk so I used a set of Opera strings given to me by @MrYikes . Although the after length was 10 cm because of the undersized tail piece, I had more than enough string length. 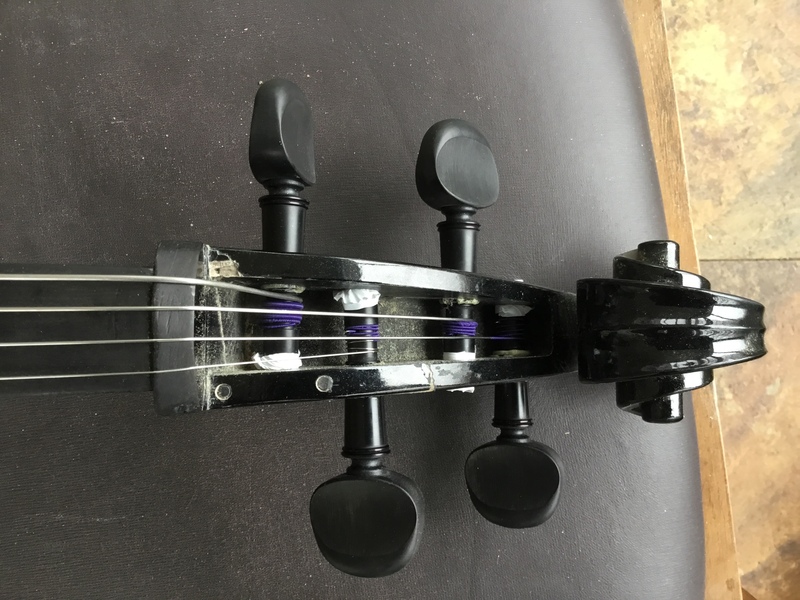 Although I am a complete novice on the cello, I am very encouraged by the resonate sound produced by the combination of the undersized tailpiece and the Opera strings, particularly on the c and g strings. I am using a clone of the Jon Paul Fusion bow (wood veneer over cf). Decent stick but disappointing hair. Going to replace hair with black hair. ha, ha, reminds me of the guys in the North East on crappy ski equipment who put us city folk with fancy gear and outfits the color of the season to shame! @bocaholly and others. For most of my youth, I must admit that my ski equipment left much to be desired. My parents did insist (thank God) that my safety release bindings were top shelf. Come to think of it, something similar could be said for this cello. @cid . I now see what you are talking about regarding electronic tuner responsive on the cello. My favorite tuner is the Korg Orchestral Tuner OT-12. It had a very hard time picking up the c and g string as I was trying to initially tune the strings. Since it was a electronic cello, I plugged in a cord between the output of the in board instrument pre-amp and the tuner, and perfect response was immediate. I purchased a Shadow violin pickup that is intended to be inserted in the bridge’s wing slots. I am going to attempt to retrofit it for an acoustic cello. In this way, I should be able to use the pickup to relay the signal to the tuner. Since pin stripes are completely out of my line of vision with the cello, I want to be able to use the tuner to keep track on my intonation. I am thinking of getting the Korg TM-60 Tuner Metronome from Fiddlershop. I am going to see if they have the Korg TM-60C. This the the TM-60 with the CM-200. I was looking at the model without the metronome, but the metronome would really help me. I get list in a song and just don’t keep the beat steady. I also have trouble counting when the measures are a heavy odd mix of 8th and 16th notes (part is my mental block with 8th and 16th notes). I know how to count them, but again, I hear the song and forget the timing details. In scales, it would help me keep steady. This is the description from the Fiddlershop TM-60 item. I looked on the web and I think it is what would work for me. I can’t order it until next week or the week after. Yep, those C and G strings are too low to get a quick response. @cid . Thank you for suggesting the Korg CM 200. I did not know about it. A general caution about electronic tuners. I like tuners which provide the octave. It is surprisingly easy for the novice to tune to the right note on the wrong octave, with disastrous results. Sounds like a plan @Irv !!!! @BillyG and others. If I knew arduino programming I could likely breadboard one for $30. I could then single handedly terrorize a whole generation of string students and make money from their mothers to boot. @Irv I use my other cello and my piano as an octave guide for my instrument tuning.